Is cassava flour the holy grail of gluten-free, grain-free cooking? It very well may be. But first, there are 5 things you need to know about it. Cassava flour is gaining momentum as a “go-to” gluten-free, grain-free flour. And it’s not surprising when you consider that those who follow restricted diets typically have to blend several flours to achieve the same consistency as wheat flour. Which is never ideal. But with cassava flour, that’s not the case. After traveling Bali and Southeast Asia for several months (eating delicious, locally made cassava breads, cakes and side dishes), I realized the huge potential of cassava flour. In fact, it seemed to be a pretty darn close replacement for wheat flour. Oh, could it be? Could it really be?! The cassava plant is a staple crop to millions of inhabitants in South America and parts of Asia and Africa. 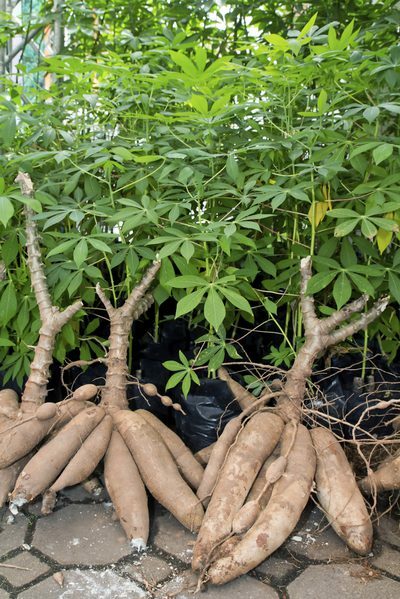 The plant produces the cassava root (also known as yuca or manioc), a starchy, high-carbohydrate tuber – similar to yam, taro, plantains and potato. As a tuberous root vegetable, cassava is gluten, grain and nut-free, as well as vegan, vegetarian and paleo. While sometimes the terms cassava flour and tapioca flour are used interchangeably, there are in fact distinct differences. Tapioca is a starch extracted from the cassava root through a process of washing and pulping. The wet pulp is then squeezed to extract a starchy liquid. Once all the water evaporates from the starchy liquid, the tapioca flour remains. Alternatively, cassava flour is the whole root, simply peeled, dried and ground. This means it has more dietary fiber than tapioca flour – and allows me to make cassava flour tortillas, which would not be possible with tapioca flour. It’s true that the cassava root contains naturally occurring cyanide compounds (also found in almonds and spinach!) and that yes, they can be extremely toxic. But only if eaten raw. That’s why the traditional cultures who rely on cassava for sustenance have centuries old processes of soaking, cooking and fermenting. These processes remove the toxic compounds and prevent one from getting sick. Rest assured that all commercially available cassava and tapioca flours do not contain any harmful levels of cyanide. Given that cassava is a starchy tuber, you would expect it to have a high carbohydrate profile. But it’s higher than you most likely imagined. For instance, per 100 grams, cassava has double the calories and carbohydrates as sweet potato. This makes it a valuable and relied upon food source for millions of native people. But it could mean an insulin spike for you! For the vast majority of people who don’t rely on cassava for subsistence, it would be prudent to monitor your cassava intake. Particularly if you’re following a low carbohydrate, low-sugar or Paleo-based diet. This is the holy grail characteristic of cassava flour. Unlike other gluten-free flours such as almond or coconut flour, cassava flour is very mild and neutral in flavor. It’s also not grainy or gritty in texture – rather, it’s soft and powdery. These qualities, along with the fact that it can be replaced on a 1:1 basis with wheat flour in many recipes, make cassava flour a preferred flour for gluten-free, grain-free baking and cooking. It’s also a great nut-free flour. As always, quality matters when it comes to cassava flour and Otto’s Cassava Flour is the brand that I use and recommend. Unfortunately, I’ve recently heard from readers who’ve used other brands that their results were less than stellar. As cassava flour has grown in popularity and manufacturers are popping up left, right and center, it seems quality and how the flour is processed now varies greatly. Therefore, if you have any problems with the cassava flour recipes listed below, know that it’s likely the brand of cassava flour you’re using.